Synopsis: The insomniac (Edward Norton) and Marla Singer (Helena Bonham Carter) decide to settle down in the suburbs and start and new life together. They start a family and make new friends with a weekly get together to discuss books. Soon the insomniac finds himself in familiar territory when this club grows past books. I am Jack’s footnotes. Memorable Scene: At one Book Club meeting a good friend and neighbor has a slight allergic reaction to peanut brittle. As he lies on the living room floor the group surrounds him and begins to chant his name. “His name was Chet Burnstein. His name was Chet Burnstein.” They repeat over and over. The chant continues until Chet sits up and reminds the group that he’s fine. He was simply lying on the floor until his asthma subsided. Plot: Edward Norton reprises his role as the insomniac with multiple personalities. Though his life seems to be headed in a different direction after surviving a self-inflicted gunshot wound to the head and the revelation that his best friend Tyler Durden was in fact his own psychosis. With his life in shambles this former insomniac turns to the only women he’s ever truly loved for support, Marla Singer. The two form a close bond and he a Marla settle down in the suburbs where they eventually get married in small ceremony at their local rec-center. After a few unsuccessful pregnancies Marla finally gives birth to twin boys named Tyler and Durden. When things start to get too stressful around the house for Marla, her husband suggests joining a club with some of their friends from the neighborhood. He decides to start a book club where the rules are simple. 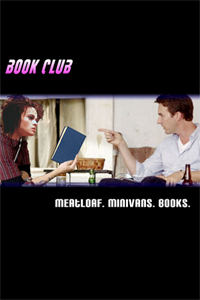 The first rule of book club is; you do not talk about book club, and the second rule of book club is that you have to bring a snack, and if this is your first night at book club, you better ready to have some fun! Book club was fun. Everyone enjoyed reading about the adventures of Bella and Edward in “Twilight” and they had a good cry over “Fried Green Tomatoes”. Book Club brought Marla and her husband closer together, or so he thought. Soon Marla would begin making every decision for her husband. They would go shopping for the kids on the weekends and do laundry every Friday night as scheduled. Then Marla started picking out her husband’s outfits and before he knew it, they were walking around the mall in matching cat sweaters. Even Book Club grew out of control once Marla took over. She turned their simple social event into deep book dissections that would last hours. There was nothing the insomniac could do but drink his problems away and let his sleep escape him once again. It wasn’t until Marla started bringing up extended trips with the in-laws, that her husband realized he had once again blurred the line between reality and imagination. She wasn’t the same person he had married… she wasn’t even real. The only way to escape Marla was to finish what he started years before. The insomniac needed to take his own life. With his gun gripped firmly in hand he interrupted a man reading “Hi God It’s Me Margret” and proceeds to fire the gun into his mouth. I am Jack’s boring suburban life. Love your movie blog! I like that you provide the memorable scene for the movie. Have you seen the Fake Film Festival contest that Virgin Radio is doing? The winner gets a $10,000 cash prize… and they are hilarious – http://bit.ly/hZThmQ Juno in one minute is surprisingly accurate. Check it out!